My phone rang this morning at 12:40 AM. It was my Egyptian friend Joe. He and his family were across town at the Coptic Orthodox church attending the annual Christmas Eve prayer vigil. (Many branches of Orthodox Christianity celebrate Christmas according to the old Julian calendar on January 7th.) I could hear the sound of many people in the background, the voices sounded festive and happy. I breathed a sigh of relief. Only a week ago over 20 Coptic Christians were killed and over 70 wounded in an attack on a Coptic Church in Alexandria on New Year’s Eve by Muslim extremists. Joe was just calling for a ride home for himself, his wife, and three kids. Taxis are hard to come by late at night here in Amman, and with 100s of other worshipers looking for a ride home it was impossible to find a ride. I was glad he wasn’t calling with other news. The street corner was crowded with people streaming out of the church; conversing, laughing, and waiting for rides. The Coptic priest (obvious in his traditional black robes and long beard) was blessing children. 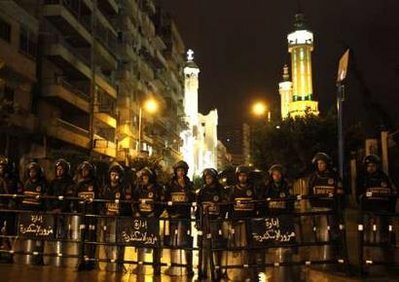 A typical Coptic Christmas if it hadn’t been for the two police officers not far from the priest’s elbow and the cars with flashing lights posted on the street nearby keeping an eye on the proceedings. Joe and I exchanged the traditional Arabic Christmas greeting “Every year goodness to you.” “And Goodness to you.” (Interestingly, this is also a standard Muslim greeting during their holidays.) The family was happy and dressed in their Christmas best. 4-year old Tony was dashing in a full suit and bright red tie. They said that it was the first year that the church had been completely packed. Every seat, both downstairs and upstairs was taken and there was no room even to stand. I congratulated them, but expressed my surprise given the recent attacks in Egypt. Joe replied that first of all, those types of attacks could never happen in Jordan because the government here takes a strong position against extremism and terrorism. Joe thanked God for the safety his family felt as Christian minorities in this Islamic nation and for the police who were stationed near the church during their Christmas Eve vigil. Secondly, and more important, Joe said that when people face troubles they turn to God and that is why the church was packed out for the 4+ hour prayer vigil marking the eve of Jesus’ birth. Persecution of Coptic Christians is not a new thing and the New Year’s Eve attack is just the latest in a long line. One year ago on Christmas Eve 2010 a gunman shot 7 worshipers (and 1 Muslim security guard) dead at a Christmas eve vigil in Egypt. 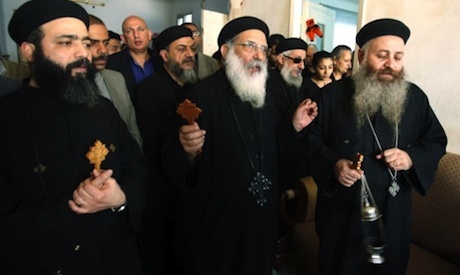 In 2009 attacks on both Christmas and Easter Eve services left Copts dead there as well. And the violence is not just restricted to holidays. This past April an estimated 3,000 Muslim attacked Christians in Marsa Matrouh in northern Egypt causing hundreds of Copts to seek haven in a church. Over 50 homes, shops, and cars were destroyed in that incident. The list could go on and on. However, it must be noted that this violence against Christians is not condoned by all. A group of Muslims gathered near Coptic churches in Egypt last night in a show of solidarity with their Christian neighbors. 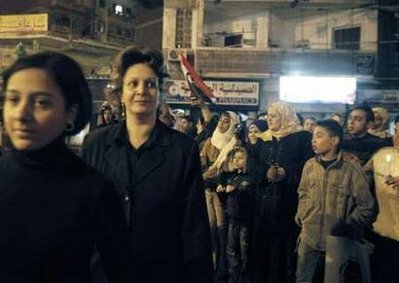 The Egyptian government posted riot police and bomb squads near churches and the sons of Egyptian president Hosni Mubarak attended Christmas vigils. Extremists have taken responsibility in the latest attacks and are calling for more. Thankfully nothing happened last night in Egypt or here in Jordan. But what will happen when the media attention fades and the security details go back to normal duty? 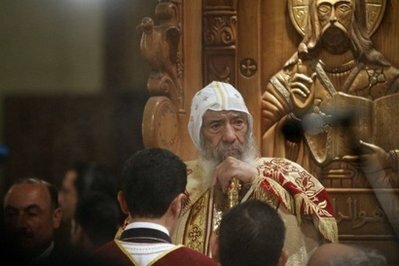 It seems just a matter of time before another attack shakes the Coptic community in Egypt. I hope Joe’s confidence in his family’s safety and security here in Jordan holds true. People of peace from all faiths and walks of life must take a serious stand against religious violence and the murder of innocents. Recent Thoughts on Osama bin Laden and Martin Luther King Jr.
Osama bin Laden has been getting on my nerves lately. Not personally, mind you – we’ve never met. But he released a speech recently that did two annoying things. (1) he claimed that the Pope was responsible for recent reprints of the cartoons of Muhammad in the Danish press, stating that Benedict XVI was part of a “new crusade”against Islam. (2) Bin Laden again co-opteed the Palestinian cause for his own purposes saying that, “Palestine cannot be retaken by negotiations and dialogue, but with fire and iron.” (BBC reporting here) And also encouraging support for Palestine by joining the “jihad” in Iraq. Like that even makes any sense. I find these two items annoying for two different reasons. (1) When Bin Laden speaks out against the cartoons of Muhammad and links them in some obscure and nefarious plot by the Pope he connects with certain “fears” that exist in the Muslim/Arab psyche. Namely that Christians are in the business of antagonizing and disrespecting Muslims and that, worse yet, Christian leaders are plotting a crusade against Islam. (2) When Bin Laden links himself to the Palestinian cause he connects with certain “fears” that exist in the Western psyche. Namely that muslims are religious extremists and that bin Laden, the Palestinians, and probably most Muslims are in cahoots against Israel and the US (and apparently Europe now). Basically Osama bin Laden is a fear monger playing both sides against each other. Hitting at the core of what both sides worry about and what the other side doesn’t exactly understand. (Americans don’t generally get how anyone could be that upset about a cartoon and Muslims don’t understand why they are always guilty by cultural/ethnic association). Hmm . . . and that was just the tip of the iceberg. Interesting, though to note the thin thread of connection with Palestine that I had not been previously aware of. Also interesting how having access to obscene amounts of money and powerful networks can “help”you cope with life’s tragedies in any way you want – from buying real estate and cars to fomenting religious extremism. The episode is around 40 minutes long and well worth a listen (Fresh Air -The Bin Ladens a Complicated Family Tree). You can also find an excerpt from Steve Coll’s new book which deals with the broader family – not just Osama. And now for the MLK connection. Today (well, Friday April 4th) is the 40th anniversary of his assassination. My friend David has posted a fitting recognition with some meaningful links. You can also look at a nice photo essay on BBC about some of today’s commemorative activities or a photo essay about MLK’s life at TIME. Martin Luther King, Jr. and Osama Bin Laden. Both charismatic. Both standing against oppression. Both still speaking today even though one is in hiding and one is in the grave. History will most likely count both of them as great leaders. Yet, these two men could not be more different. One espouses the glories of martyrdom for a cause he is barely connected with, in hopes of using violence to end one form of oppression in favor of another. The other man dying as a martyr while he peacefully, but actively struggled to bring an end to an oppression that he knew all to well. MLK did not look at death as something to be sought, but was not afraid to face it. His martyrdom was significant in bringing a peace (though imperfect) to a troubled nation. Both men fighting against oppression. One preaching violence, another peace. One encouraging others to die from a distance. The other dying unexpectedly right in the thick of the struggle. Who knows what historians will say about Osama bin Laden and Martin Luther King 100 or 200 years from now. 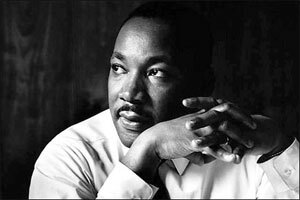 All I know is that from this angle, the martyrdom of MLK speaks more loudly from beyond the grave and is more relevant to Christians, Muslims, and Jews everywhere in this troubled world than OBL’s poisonous rhetoric from his hideout in a cave. 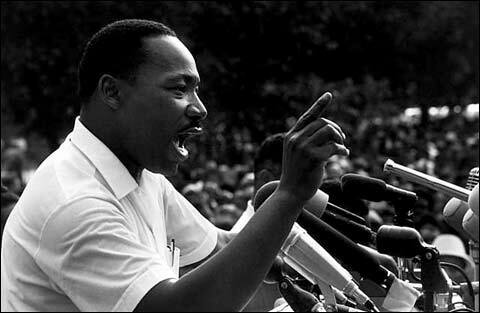 Here’s a 9-minute clip of MLK’s last speech given 40-years ago this past Thursday. If you don’t have time for that, click on the second one – it’s only 90 seconds or so. Profound, timeless, and a relevant example for all those seeking to end oppression and make peace in this world. You may or may not be aware of my friend David’s blog. A week or so ago his blog alerted me to a very fascinating discussion about the difficulty of reconciling the violence that the God of the OT seems to advocate with the teachings on love and peace from Jesus over in the NT. For me this issue also speaks to the Christian-Muslim dialogue, in that the OT and Qur’an can sound similar re. the topic of religious violence, yet the NT is very different. Boyd is a former atheist who became a Christian and now pastors a church in St. Paul Minnesota. He’s posted 3 reflections on this discussion of OT violence vs. NT peace and love. I’m still working through the posts – there is a lot to think about in each one. I expect to post some sort of response as a comment on this post here sometime next week – but if someone else beats me to leaving any thoughts or comments here that would be great! A number of years ago I read a Christian apologist who argued that one proof of the Bible’s inspiration is the fact that it is “the most beautiful book ever written.” Now, I believe the Bible is divinely inspired. But this statement made me wonder how many books this guy had actually read. In fact, it made me wonder if he’d read the Bible! Here’s an inspired verse I don’t find particularly beautiful. When an army conquered a city in the ancient world the victors would sometimes celebrate by smashing the heads of the infants against rocks. (Possibly inspired by this verse, this practice was resurrected by Christian Crusaders conquering Muslim cities). In this dark passage, the Psalmist is eagerly looking forward to this being done to Babylonian infants. He thinks the warriors who get to do this are lucky! Most beautiful book in the world? Sorry. I’m not feel’n it. If you’re like me and you’ve struggled with reconciling passages like this with Jesus’ commands to love our neighbors and enemies then take the time to check out one or all of Boyd’s posts below. Divinely Inspired Infanticide and Genocide? What’s at Stake in Trying to Explain the Violent God of the Old Testament? And here is Greg’s website if you’re at all interested in his ministry. I’m thankful to David for pointing out this resource and will most likely be reading one of Boyd’s books (Myth of a Christian Nation, Lord or Legend: Wrestling with the Jesus Dilemma) soon. On a side note some of you may recognize Greg Boyd’s name. He is a prominent supporter of what is termed open theism. This makes Boyd somewhat controversial in some evangelical circles. But as you all know, I won’t shy away from a good controversy. I don’t have the time or inclination to adress open theism in this post. If you would like to read something about it, you could start here.